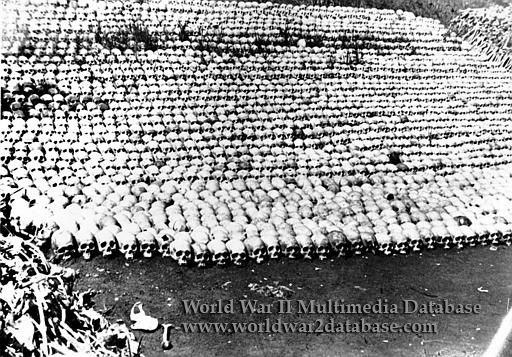 A Stadium of Skulls erected by the citizens of Hengyang in Hunan Province as a memorial to their relatives, massacred by the Japanese in 1944. Buried in shallow trenches, the fleshless skeletons were exhumed right after the war. Then, the whitened skulls were arranged in tiers to simulate a grandstand of ghosts overlooking the scene of their slaughter. During the Ichi-Go Offensive's Battle of Hengyang-Changsha in June 1944, after taking Changsha, two Japanese military detachments moved on to besiege Hengyang on June 22, but the Chinese National Revolutionary Army's Tenth Division repelled their advance twice. In August 1944, Japanese troops again attacked Hengyang with the help of air support. Nationalist Chinese resisted, using knowledge of the terrain. The Chinese defences were intelligently constructed and used crossfire zones to maximize firepower. This broke the advance of the Imperial Japanese Army's 11th Division. After taking heavy casualties, the Imperial Japanese Army's 58th Division broke into the city, and the 11th Division resumed their attack. Biological and chemical weapons were used by the Japanese. Reinforcements sent by the Chinese National Revolutionary Army attempted many times to reach Hengyang, but were blocked. After 47 days of bitter fighting, the Japanese troops managed to occupy Hengyang on August 8. They paid a heavy price in casualties, with 60,000 troops. The Japanese inflicted 55,000 civilian casualties and 100,000 Kuomintang. After the surrender, the Japanese forced all able-bodied persons to hard labor without adequate food, water, or shelter. Some wounded were buried alive; others were collected at the Chuanshan Middle School, where they were left to die. Mass graves on the outskirts of the city were dug up in 1946.